Combine the 5 zords to create the main Megazord from the Megaforce TV show. Includes 2 Power Rangers Cards to use with the Deluxe Gosei Morpher (sold separetely). Contains 5 Zords to help the Power Rangers defeat their foes, but when you combine all 5 Zords together they will create the Megazord! Megazord will overpower all enemies the Power Rangers team have to face. 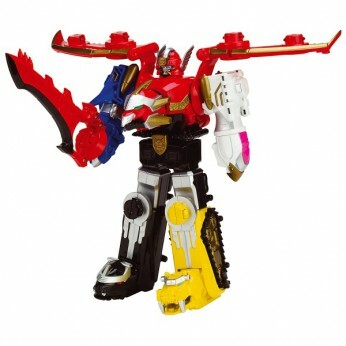 Includes 5 transforming animal zords – a dragon, a snake, a shark, a tiger and a phoenix. Combine them to make the Megazord and use with other zordbuilder products (sold separately). Styles may vary; For ages 4 years and over; EAN: 3296580350957. WARNING(S): Not suitable for children under 3 years old. Only for domestic use. This toy costs approximately £34.99 (for the latest and best prices make sure you check our retailer list for the Power Rangers Megaforce Gosei Megazord above). In our review of Power Rangers Megaforce Gosei Megazord we classed it as being suitable for ages 3 years, 4 years, 5 years but recommend you check the manufacturer specific advice before purchasing.